...the sixth graders had begun to sort themselves into groups, associating only with kids like themselves (popular, band, jock, brain). To Lucy, it made no sense. She had watched it happen--kids splitting and regrouping with all the forethought of single-cell amoebas. As soon as kids found their groups, they avoided Lucy. If the other sixth graders were like pocket change (dimes, pennies, nickels, quarters), then Lucy had always been more like a button, a foreign object. In elementary school, being unique was cool, but in junior high, kids needed a way to define you, or it was the kiss of death. And the strangeness of junior high didn't stop there. No, as the weeks went on, the sixth graders had developed other signs of junior-high sickness. When teachers turned their back, notes about who liked who traveled palm to palm, and books with dog-eared pages describing people "doing it" were read under the lips of desks. In elementary school--only five months ago--everyone had acted normal. Now, after a summer and a couple of months in junior high, they were cliched characters from a drippy teen movie! Her best friend is, as always, supportive, but she's found her niche with the artsy kids. So. School is uncomfortable at best. Also, Lucy's mother has left town on an extended photography shoot, leaving her at home with her mostly-silent (except when he's creating more rules) father. Lucy Moon is feeling decidedly un-Lucy-like. 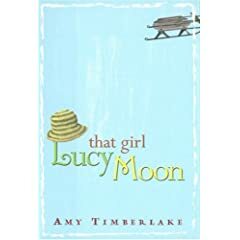 But when two classmates are arrested while sledding on Wiggins Hill, the local newspaper refuses to run the story, and the richest woman in town begins construction on a fence around the sledding hill, Lucy takes action. She starts a Free Wiggins Hill campaign that gives her a brief taste of popularity -- of course, it doesn't take long for it to land her in a whole lot of trouble. Her unofficial punishment is at the hands of her peers. Her official punishment comes in the form of Mrs. Myra Mudd, Youth Action organizer and president of The Tiny Tims & the Healing Power of Dickens. Lucy is likeable and (mostly) fearless, but also imperfect and realistic. A lot of kids will be able to identify with her. A good, solid read for young fans of realistic fiction.